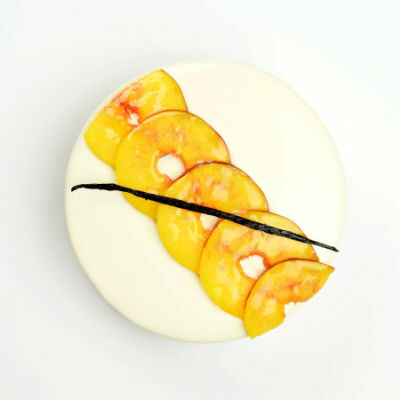 This is a very classic lemon tart, but with a few tweaks and contemporary influences. 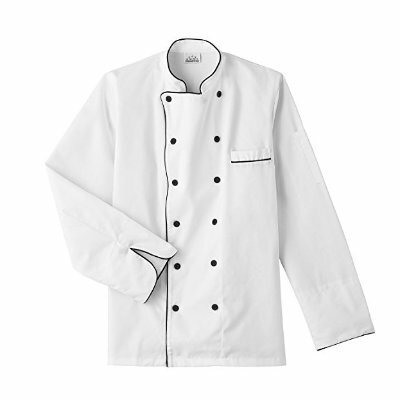 For something so seemingly simple, perfect presentation matters. A few subtle surprises like hints of olive oil and pistachios really elevate this tart beyond just looking pretty. This recipe uses less butter in the filling than more traditional recipes, mostly because my personal taste prefers the bolder lemon side of the tart. I also use a tiny bit of olive oil, an addition inspired by Eleven Madison Park's lemon-poppy seed cake with candied olives. Makes 2 medium 8-inch tarts, or 1 large one with some leftover components. If you have not already, please read how to make pâte brisée for a more detailed tutorial on how to make this step. Cube the chilled butter and sift the flour + salt over it. Use your fingers to press the flour into the butter, eventually forming a fine powder with little globs of butter. Transfer the dough to a stand mixer fitted with the paddle attachment. Turn on a medium speed and add ice water one tablespoon at a time until the dough just comes together. Flour a work surface and knead the dough to form a smooth ball. Divide into two, flatten each into discs, and refrigerate for at least 30 minutes. For each ball, pound out the dough and roll out from the center to form round sheets. Each sheet should be about 1/4 inches (0.6 cm) thick. Roll the sheet up on a rolling pin and unroll over your tart ring. Press the sheet into the ring and trim the edges. Use pie weights to hold down the bottom of the crust. Bake the tart crust at 375°F for 20-25 minutes until golden brown. Let cool before filling. Sometimes you will see lemon zest on a recipe and think "I can skip that step." Not the case here. The zest actually adds more of the lemon flavor to the filling than the lemon juice itself. To incorporate it and extract as much of the oil as possible, mix it with the sugar. Get a metal bowl and place your eggs inside. Start to simmer a pot of water for the bain-marie (hot water bath, pronounced "bahn-muhree"). Heat this mixture over the bain-marie until the temperature reaches 185°F (85°C). At 185°F (85°C), the curd will be thickened by the eggs. Remove it from the heat. Wait for the lemon curd to cool before beating in the butter. It should be around 135°F (57°C). Then, working one small cube at a time, add the butter to the lemon curd and beat it in until it is fully incorporated and there are no clumps. Add in the olive oil and fully incorporate. The curd will still be quite liquid at this point, so don't wait too long or it will cool and thicken even more. 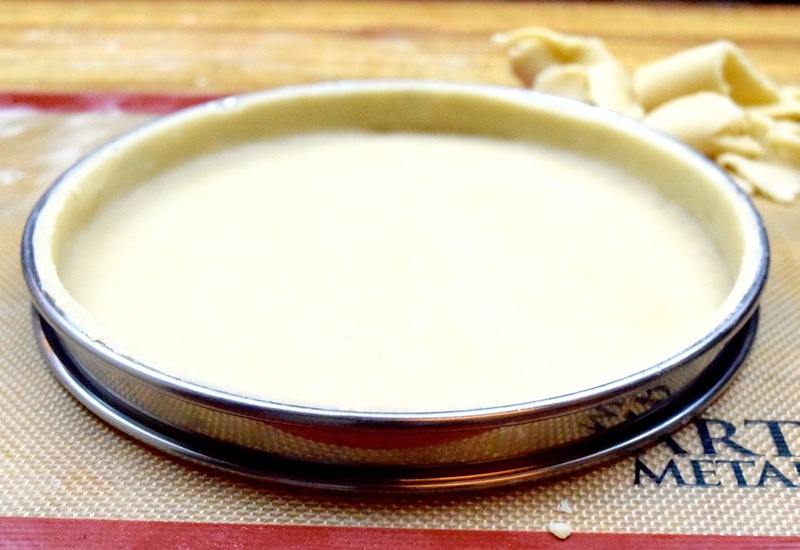 While still usable, it will be harder to get a clean finish on the top of the tart. The candied lemons serve primarily as garnishes, but they are quite delicious on their own. 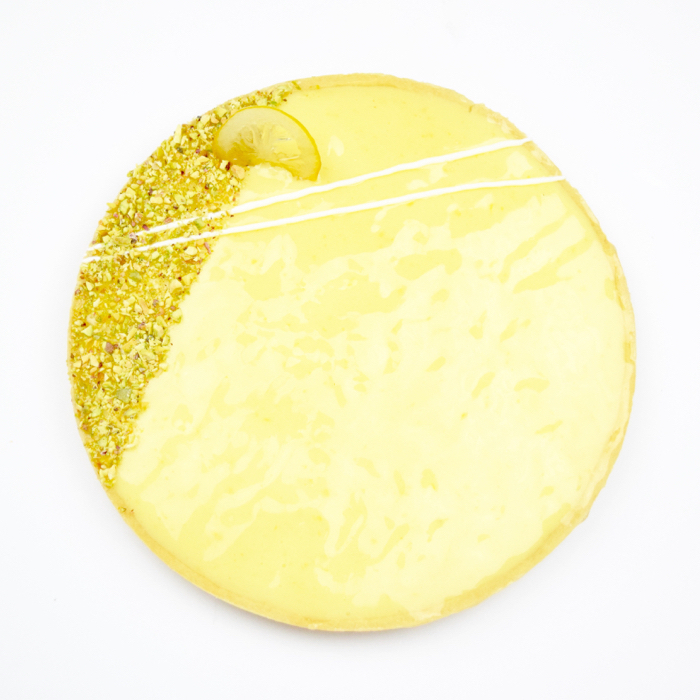 An alternative way to decorate the tart would be to spread the lemons over the surface of the tart for even distribution of candied lemon bites. Since they take up to 2 hours to prepare, feel free to omit them. Slice your lemons into consistent thicknesses. The thickness of the slices doesn't matter too much, but they should not be paper thin nor should they be inconsistent. Place your lemons in a saucepan. Turn the heat up to high and bring the water and lemons to a simmer. Just as the water starts to bubble, turn off the heat. Drain the water from the lemons. Cover the lemons with cold water again, and repeat this process. This will start to soften the lemon rinds and pull out bitterness and unwanted flavors. Now cover the lemons in simple syrup. Let this simmer for about 35-45 minutes until the rinds are fairly translucent. At this point your candied lemons are ready to go, but you will have some leftover simple syrup. Obviously, you will want to save this, which is now infused with delicious lemon flavor. After the repeated simmering, this will not be the light and acidic flavor of lemon that you might get with fresh lemon juice. It will have a deeper flavor from the lemon oils, making it a good choice for stronger cocktails. 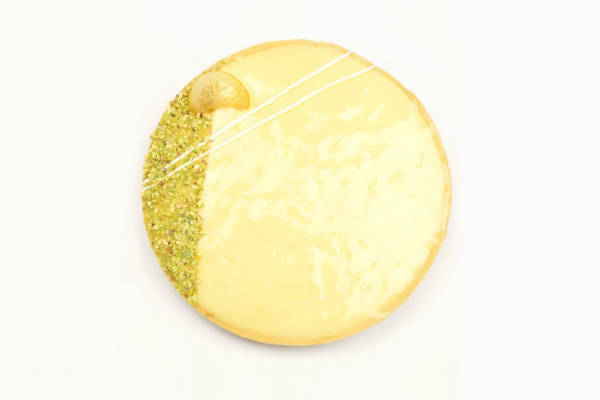 Small details like a good shiny glaze make all the difference between a "Martha Stewart lemon tart" and a "Pierre Hermé tarte au citron." So while this step is technically optional, why bother going through all this work to make a mediocre tart? If you have not already, read how to make neutral nappage for a more in-depth tutorial on how to make this glaze. Note that the recipe below is scaled to 1/4 of that recipe, which is a bulk preparation. Mix the sugar and pectin in a bowl and set that aside. Heat the water to 113°F (45°C). Aim for as close to this temperature as possible. 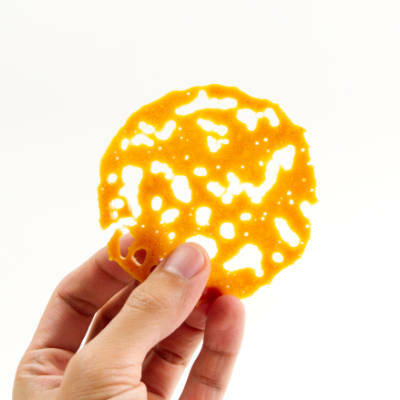 Pectin can be fickle and will look for any reason not to cooperate. Stir in all of the sugar and pectin at once and whisk to dissolve. Bring this to a boil for about 3 minutes and remove from the heat. Add in the lemon juice, stirring to combine. Let this mixture cool to 95°F (35°C), but stir every 5 minutes or so to cool evenly. Once it has reached this temperature (or is thick enough to brush with), you can begin brushing the tarts. 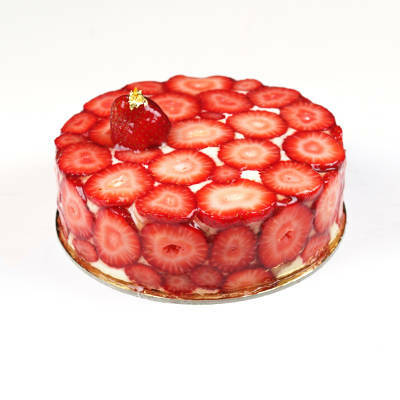 Freeze the tart crust with the filling until ready to brush with the glaze and garnishes. 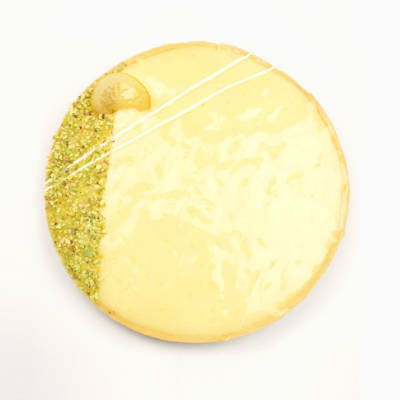 Melt the white chocolate in a microwave for 30 seconds. Place the melted chocolate in a pastry bag or parchment paper folded into a triangle. Cut a small tip on the end to pipe out the chocolate in fine lines.